​Ouzo is an anise-flavored aperitif widely consumed in Greece. Its taste is similar to other anise liquors like pastis, sambuca, arak, rakı, and masticha, traditionally produced and consumed in Mediterranean countries. Ouzo can be described to have a similar taste to absinthe which is licorice-like, but smoother. ​Ouzo has its roots in tsipouro (aka raki or tsikoudia) which is said to have been the work of a group of 14th-century monks on Mount Athos. It is flavored with or without anise. Gradually the production was spread in various parts of Greece, but its standardization started only the last decades of the 20th century. The production is based on the distillation of the mass that remains following the compression of the grape pulp to produce wine. A similar drink is also produced in other Mediterranean countries known under other names such as grappa or arak. ​Ouzo is traditionally mixed with water, becoming milky white, sometimes with a faint blue tinge, and served in a narrow long and tall glass with ice cubes. Ouzo or tsipouro can also be drunk straight from a shot glass. Ouzo or tsipouro is traditionally served with a small plate of a variety of appetizers called meze, usually small fish or seafood (octopus, sardines, calamari, clams), olives, sharp yellow cheese and/or feta cheese, slices of tomatoes and cucumbers fresh or pickled, dolmas rolled grapeleaves stuffed with rice, spicy sausages, and a wide variety of other snacks according to availability and choice, often served with toothpicks instead of forks. Meze is not a meal course like an appetizer (though meze dishes can be served as appetizers), but rather a dish, hot or cold, spicy or savory, often salty, that is served as a separate eating experience to complement and enhance the taste of the drink and to provide the backdrop for a social gathering. Unlike appetizers (orektika in Greek) which are intended to whet the appetite for the meal to come, it is common for groups of family and friends to gather or go out for meze, share several of these delightful dishes, between drinks, conversation, and laughter. The little plates are shared by everyone at the table, which not only provides a wonderful variety of flavor and texture sensations but also creates the kind of happy, convivial (perhaps noisy) atmosphere for which Greeks are well known. The European Union now recognizes ouzo, as well as the Greek drinks tsipouro and tsikoudia, as products with a Protected Designation of Origin, which prohibits European makers other than Greece and Cyprus from using the name. ​Ouzo production begins with distillation in copper stills of 96% alcohol by volume (ABV) rectified spirit. Anise is added, sometimes with other flavorings such as star anise, fennel, mastic, cardamon, coriander, cloves, and cinnamon. The flavoring ingredients are often closely guarded company "recipes", and distinguish one ouzo from another. The result is a flavored alcoholic solution known as flavored ethyl alcohol, or more commonly as ouzo yeast (the term being used by Greeks metaphorically to denote that it serves as the starting point for ouzo production). The ouzo yeast is then distilled. After several hours of distillation, a flavored distillate of approximately 80 ABV (% Alcohol By Volume) is produced. The spirit at the beginning of the distillation (heads) and end (tails) is usually removed to avoid light and heavy alcohols and aromatics. The heads and tails are usually mixed and distilled again. The product of this second distillation can be used to produce a different quality ouzo. This technique of double-distillation is used by some distillers to differentiate their product/s. Makers of high-quality "100% from distillation" ouzo proceed at this stage with water dilution, bringing the ouzo to its final ABV. But most producers combine the "ouzo yeast" with less expensive ethyl alcohol flavored with 0.05 percent natural anethole, before water dilution. Greek law dictates that in this case the ouzo yeast cannot be less than 20 percent of the final product. Sugar may be added before water dilution, which is done mostly with ouzo from Southern Greece. The final ABV is usually between 37.5 and 50 percent; the minimum allowed is 37.5 percent. Ouzo production itself does not include fermentation. 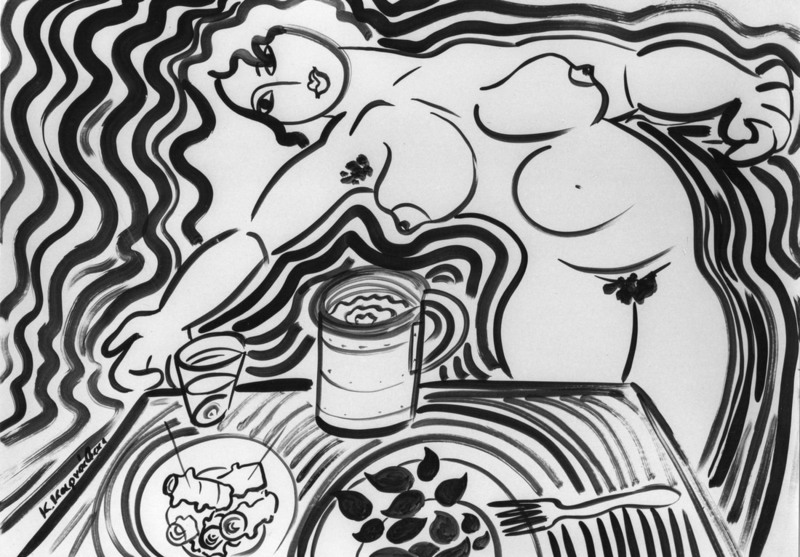 Girl with Meze drawing with india ink by Kostas Karnavas, 1982. 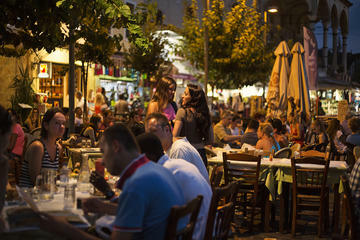 Athens at night can transform even the most skeptical romantic. Come experience a completely different side to the city as you walk through its historical center and bustling neighborhoods after dark. Listen to urban stories and myths, sample the best local spirits, and try mouthwatering finger food, in an Athens only known by locals!